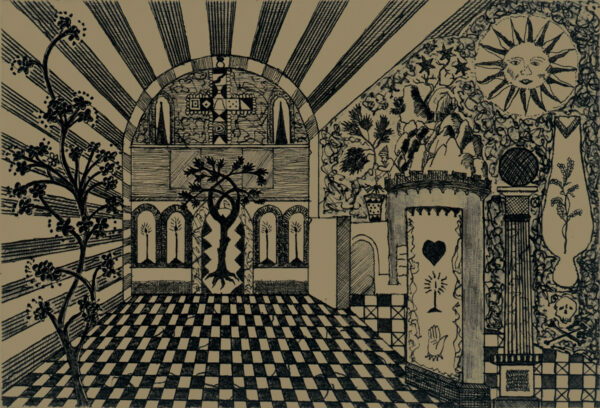 Chequered Future combines a grotto interior with arcane line drawings, offering an entrance to an imagined interior space. Drypoint is an intaglio technique whereby the metal or acrylic plate is inscribed using a sharp tool to create a burr which holds the ink. The line that is created is furry as the ink is trapped under the burr. This print was created using an electric engraving tool worked into the surface of polycarbonate. Chine-collé is a special technique in printmaking, whereby usually Japanese paper has a natural adhesive applied to the back of the paper, which is placed on the inked plate with the carrier paper placed in register, and when run through the etching press, the Japanese paper is both printed upon and adhered to the carrier paper. The Japanese paper gives the print a lustrous surface quality.